Create a matrix whose row, column and data fields are all selectable from dropdown lists. Create the matrix to show whatever data the user requests. 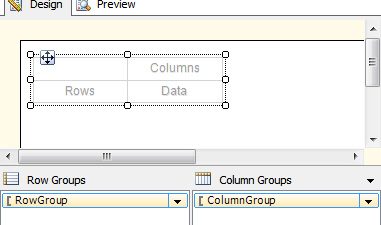 The user can choose the row, column and data fields from dropdowns. Right-click on Parameters and choose to add a new one. We'll call this parameter ColumnField, and specify that it's of type Text. Here the columns can be certificates, countries, directors or studios. The 3 parameters which will be chosen at the top of your report. 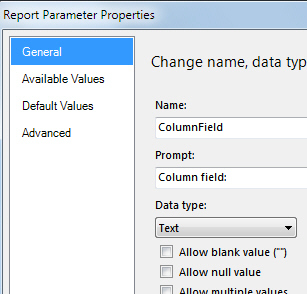 You should also set default values for all 3 parameters, so that a sensible matrix appears when you first run the report. Create a basic matrix - we'll add the row and column groupings in a second. 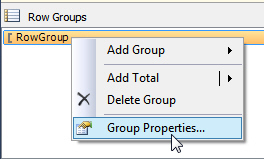 Right-click on the RowGroup and change its properties. Add a group expression, and set this to be the field chosen by the user in the drop list. The column grouping expression uses the same concept. 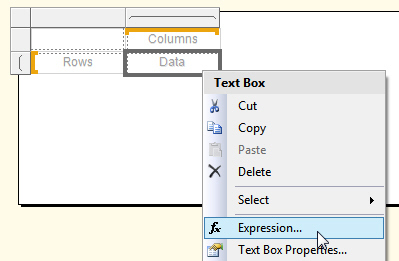 Right-click on the Data textbox and set its expression. Show the average of a field whose name is chosen by the user at run-time. 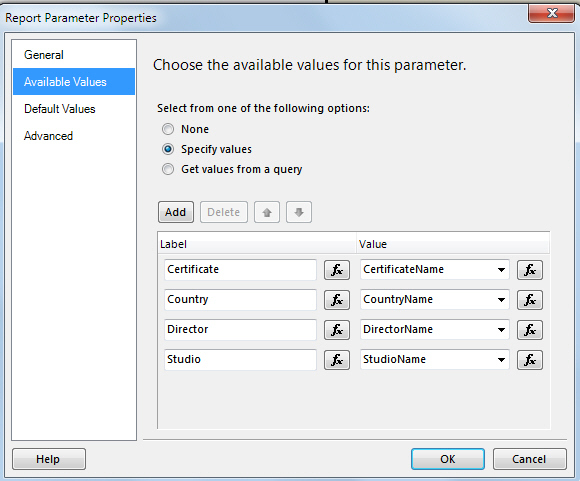 The title will refer to the parameter choices made by the user. The title if you show average budget by certificate and director. Notice that we keep repeating the same trick - using the Fields collection to refer to a field whose name is equal to the value of the relevant dropdown parameter. If you're fired up after reading this article, you could try creating a report with dynamic grouping (ie the user chooses which field they want to group by). What if I want to have multi select parameters to do this. 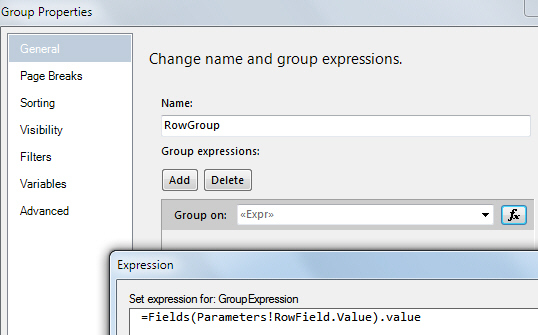 Do you have an example to set the expression for row or column groups for multi select parameters. This would effectively be like grouping with AND condition on multiple fields. An interesting question! The problem is that as far as I know you can't group by than one field at once. I think it would be very complicated. You'd have to somehow include more than one grouping level, then hide the grouping levels you didn't need if you only chose one value in the multivalue parameter. The only other possibility that I can see is to create some composite field containing all of the things you might want to group by (so if you can choose to group by one or more of Director, Studio and Certificate, create every possible combination of these fields as separate composite keys). Not only would this be ridiculously complicated, but I don't think it would give the right results.